Summer is finally upon us. After the past two months of non-stop planning, preparing, and attending happy graduation and wedding events, I am ready. Ready for two months straight of rest and relaxation. Time to reflect on the special events of the past two months. Time to be thankful for the college graduation of Brave Heart and his ensuing job in Dallas. Time to reflect upon the beauty of the wedding of Brave Heart and Beautiful Soul. Time to catch up on our neglected farm and house work. Time to read if I want, call friends if I want, take naps if I want, or choose to waste time if I want. It feels amazingly invigorating to choose what to do with my own time after months of school and family events dictating my schedule. The Outdoorsman and I have been hard-pressed to keep up with the demands of our jobs, our farm animals, and our family schedule. God has carried us through the past couple of months through His grace, prayers, friends, and family. We are thankful. Green Acres has been bursting with life over the past week. We have had seventeen “rogue piglets” born to our full-breed KuneKune mothers and a wild boar who jail-broke into their pen back in February. It was the night of the opening of the Winter Olympics and our dogs were incessantly barking so we went out there and caught the culprit in our pig pen. He met his demise that night due to The Outdoorsman’s keen hunting skills, but not before his successful visit with two of our premiere sows. The sad part is that we now how seventeen tiny, adorable wild-boar-looking-piglets who will be difficult to sell to a community overrun with wild hogs. I am hoping for the best for them since they do have a lot of the whimsical KuneKune breed standards. 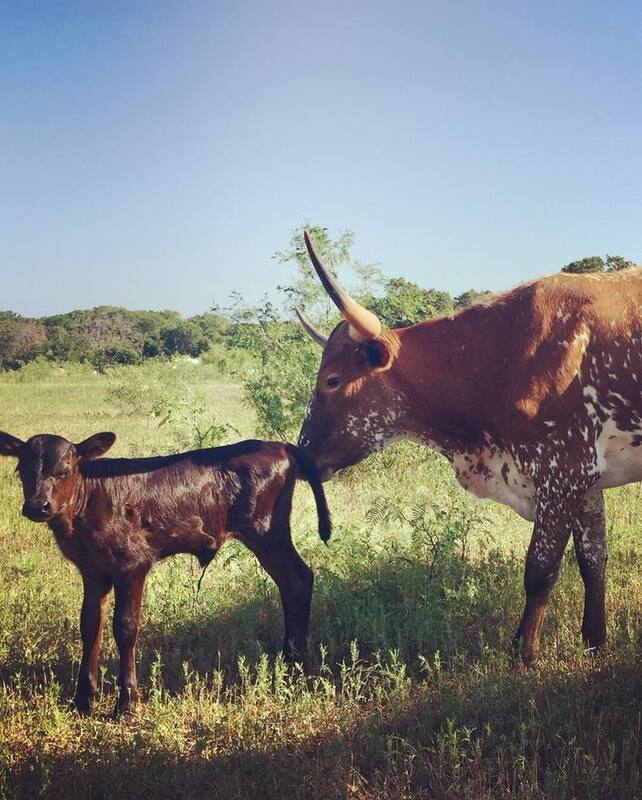 In addition to our plethora of piglets, we were also blessed with the first successful birth of a beautiful bull calf by one of our own Longhorn heifers. Our baby bull, Judge, was born on May 30, 2018 and is chocolate brown and tiny enough to walk right under his mother without ducking down. He is absolutely perfect, healthy, and adorable. We have learned so much from local ranchers about the difficulties of birthing calves from heifers due to the fact they have not birthed a calf before and sometimes have difficulty in the process. After their first calving, the heifers are called cows and should no longer have complications giving birth. (We learned this the hard way and, unfortunately, had a stillborn calf from one of our healthiest heifers earlier this month so our new bull calf was not actually the first one born on Green Acres. It was a sad day when we lost the beautiful newborn calf.) A local ranch-hand came out to Green Acres and assisted with the whole situation and taught The Outdoorsman a lot during the hours they spent together. We are grateful for knowledgeable locals who are generous with their knowledge and the wisdom that comes from years of experience. We even had help from the local auctioneer who advised us how to handle the cow after the loss of her baby calf. We are grateful for all of the help and advice we were given and have added it all to our ever-growing bank of ranching knowledge. The Outdoorsman is currently working, after his actual job each day, on ways to make things easier for us during the summer heat. Last night, he purchased six huge rain barrels and will make them into waterers to place in each pig pen in order to supply a constant source of water for them during the heat of the summer. We are currently filling water bowls as quickly as we can due to the fact that the pigs continuously dump the water out to roll in mud for protection from the heat. Pigs do not sweat so they must keep their own body temperatures down by caking mud on themselves. Isn’t that interesting? (And to think of all the times I have said I am sweating like a pig!! Haha!) Pigs are actually impressively clean and intelligent. They do not go to the restroom anywhere near their living quarters and always find a spot far away for that purpose. This summer promises to be a summer of rest for me, The Head Hen. I am planning to write blogs as frequently as possible, read some old and new books, visit with friends via calls and texts, hang out in my cozy bedroom whenever I can, drink over-sweetened coffee each morning, watch some good TV shows and movies, visit some area antique shops, gaze upon as many beautiful sunsets as possible, and take tons of pictures of our adorable animals. This summer will probably not include hosting events or visitors at Green Acres since I am sensing the fact I need time to recuperate from the past couple of months. God has told me it is okay to be alone this summer whenever possible. It is how I have always regrouped and He is helping me not to feel guilty as I go that route this summer. The Outdoorsman is on board with that and will help remind me to not plan things since it is my propensity to surround myself with people and events even when I am tired and needing rest. I am learning to listen to my mind and body as I grow older so that I can save some much-needed energy for our happy, growing, and busy family. #thankfulandblessed. Truly. God is amazing and so full of grace towards our family. Over the past thirteen years as a blended family living in different cities, He has led us across the wilderness into a rich, living oasis. He kept us close on the journey. His eyes were ever upon us and He met our every need.